3.1 What are the methods of designing FIR filters? Parks-McClellan: The Parks-McClellan method (inaccurately called “Remez” by Matlab) is probably the most widely used FIR filter design method. It is an iteration algorithm that accepts filter specifications in terms of passband and stopband frequencies, passband ripple, and stopband attenuation. The fact that you can directly specify all the important filter parameters is what makes this method so popular. The PM method can design not only FIR “filters” but also FIR “differentiators” and FIR “Hilbert transformers”. Windowing:. In the windowing method, an initial impulse response is derived by taking the Inverse Discrete Fourier Transform (IDFT) of the desired frequency response. Then, the impulse response is refined by applying a data window to it. Direct Calculation: The impulse responses of certain types of FIR filters (e.g. Raised Cosine and Windowed Sinc) can be calculated directly from formulas. 3.2 How do I actually design FIR filters? With a FIR filter design program, of course. 😉 Although it’s possible to design FIR filters using manual methods, it is a whole lot easier just to use a FIR filter design program. 3.3 What FIR filter design programs are available? 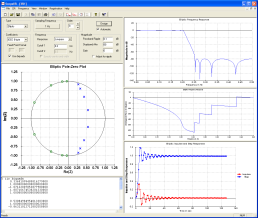 Filter Design Applications: See dspGuru’s Digital Filter Design Software page for a list of filter design programs. Near and dear to us here at dspGuru is Iowegian’s own ScopeFIR product. We believe ScopeFIR offers an excellent combination of professional features, smooth user interface, and affordable price. We sell it for just $599, with a 30 day trial period. Even if you already use Matlab, ScopeFIR’s “point and shoot” capabilities can improve your FIR filter design productivity. Math Programs: Matlab and its Free Clones offer built-in FIR filter design functions. Source code: One of the best places on the net to find source code to design FIR filters is Charles Poynton’s Filter Design Software page.